Become a part of Central Casting’s legendary database. Get booked on movies and TV shows. It’s free and easy to get started. Make a reservation to register your minor with us. At this time minors cannot register online. Bring your minor and their required documentation to your reserved registration session at our Los Angeles office. There you’ll complete paperwork, an orientation, and your minor will take a photo for our database. The Department of Homeland Security has issued an updated form I-9 that went into effect on January 22, 2017. This version requires minors (individuals 17 or under) to meet the same requirements as adults regarding the documents they can present for form I-9. Per the Department of Homeland Security, a list C document alone is no longer valid. Adults and minors are both required to either present one original unexpired List A document, or, an original unexpired List B and List C document combination. If presenting a List B document to an E-Verify employer (Central Casting), the employer can only see List B documents that include a photo. Per Federal Law, Central Casting is not permitted to register anyone, minor or adult, who does not have the required documentation. The non-photo ID options in List B do not apply to minors pursuing employment with E-Verify companies (Central Casting). That’s it. Now your minor is able to submit for jobs. Registration is for new SAG-AFTRA and non-union minors with a reservation. Minors can also come in during this time for updates. A Background Actor or extra is someone who performs in a show in a nonspeaking role, usually in the background. Central Casting registers minors from 15 days old to 17 years old to appear in our legendary database. Every day, our in-house Casting Directors use that database to cast thousands of Background Actors to work on set, often for the following day. What if my minor doesn’t have proper documentation? Those without required documentation (unexpired originals only, no photocopies) to accompany the I-9 form will be turned away. Must bring identification showing date of birth for the Age Verification form. Why can’t I register my minor online? Minors have different requirements when registering and must be registered in person. Please make a reservation to bring your minor and their required documentation to a minors registration session. Do I have to attend registration with my minor? All minors ages 17 and under must be accompanied by their parent or legal guardian. Homeland Security permits only the parent or legal guardian to fill out the I-9 form. Does my minor need a work permit? Your minor does not need a work permit to register with Central Casting, but in order to be considered for work, each minor will need an entertainment work permit issued by the state of California on file with Central Casting. What if my minor is a member of SAG-AFTRA? Please bring your minor’s current SAG-AFTRA card/receipt issued by SAG-AFTRA with you to registration. Registration is approximately two hours. We do not recommend arriving more than 10 minutes early to our minor registration. Free street parking or take the Metrolink to Burbank-Downtown. Registration with Central Casting is a privilege, not a right. We respectfully reserve the right to refuse registration to anyone. Central Casting is a participant in the E-Verify program. We will provide the Social Security Administration (SSA) and, if necessary, the Department of Homeland Security (DHS) with information from each new employee’s I-9 form to confirm employment authorization. Note: If the government cannot confirm that you are authorized to work, we are required to provide you with written instructions and an opportunity to contact the SSA and/or DHS before taking adverse action against you, including terminating your employment. Already registered? Bookmark this page to help your minor get booked on set. Call the number or email the address given on the job post. Be prepared to give the information asked for in the job post, which may include the first five digits of your minor’s Social Security number, your phone number, their full legal name, selfie, etc. The Casting Director will give you your minor’s booking information. Be sure to write this information down. You will receive a call time, category, and a show name with a passcode to access your minor’s details at the link below. Be sure to call the Call Time Change Box and enter the 4-digit number given by the Casting Director for all call time changes. We are now offering reservations for Visiting, Central Casting University, and other events. To make a reservation for an event, visit the Los Angeles calendar on the Talent page of our website. Select the event you wish to attend and click on the reservation link. If you do not see a reservation link, the event does not require a reservation. Note: You should always check the notices and calendar for updates before coming to our office. Do not need to be registered with Central Casting, but MUST be able to get a work permit before 4/17. Nia is taking submissions for a show working WEDNESDAY 4/17 in LOS ANGELES with possible recurring work dates throughout the season. She is looking for ASIAN LOOKING NEWBORN BABIES that appear 2 WEEKS to 1 MONTH OLD (or small 2 month old). Babies MUST be at least 15 days old to work. Kelly is taking submissions for a show working this FRIDAY, 4/5 in Los Angeles! Seeking HISPANIC looking TWINS! Must appear to be between the ages of 8 - 10 years old! A birth certificate or SS card will be necessary for the I-9 form if minors do not have a work permit. Should be registered with Central Casting. Sarah is taking submissions for Caucasian, African American, or Asian looking TWIN Girls that are 5 years old. Must have an I9 on file. Miranda is taking submissions for CAUCASIAN PORTRAYING MINORS who are between the ages 9-14 YEARS OLD. This is to work TOMORROW Tuesday, March 19th. Work Permits MUST be up to date!! Monique is looking for boys age 8-10. WORKS TODAY IN CULVER CITY @ 8AM. Must be able to get to set between 730 and 8am. Sarah Beth is taking submissions for Caucasian looking girls age 9-15 years old. Jimmy is looking for boys and girls (ages 12 - 17) to portray carnival goers. You should have natural looking hair with no modern day haircuts: Boys, no buzzcuts or fades and Girls: no ombre or highlights. Jimmy is looking for Caucasian looking 9 - 12 year old minors who can portray kids at a DMV office. This is a 1972 period show so boys should not have fades or buzzcut haircuts and our girls should have hair that is shoulder length or longer. 1. Son / Ox - looking for an African American looking Boy, 12-14 years old, with a thick athletic type build to portray a pop-warner type football linebacker. 2. Photo Double - looking for an African American looking Boy, age 9-15, who stands between 5'0'-5'2", around 110lbs, wearing a size 16 and a 5 shoe (we probably have wiggle room for the shoe size). Lauren is taking submissions for a show working on Monday 2/25 with a possible recall Tuesday 2/26 in LA. MUST have a valid work permit. MUST be able to cry on cue. To submit, send your minor’s name and number to laurenpsubmissions@centralcasting.com. Claire is casting babies for a new pilot! Please see the flyer and submit if you have babies who fit! Share and help us get the word out! Megan is looking for GIRLS who are 12-14 y/o, in 7th grade or above WHO ARE FAMILIAR WITH BALLET. There is a FITTING TODAY 2.20 between 3-5p. and WORKS TOMORROW 2.21 in HOLLYWOOD. Please submit with a CURRENT PHOTO AND BALLET EXPERIENCE. Include experience in email. Kelly is taking submissions for 14 - 16 MONTH OLD BABIES for a show working next MONDAY, 2/4! Babies must have BLONDE HAIR and BLUE EYES to match babies currently working! Multiples preferred, but singles will be considered! Babies have to be ideally 15 months old by Monday, 2/4! Infant doesn’t need a photo ID, but a birth certificate or SS card will be necessary for the I-9 form. Katie is taking submissions for a television show working on Thursday, January 31st with a possible recall on Friday, February 1st in Los Angeles. Seeking Caucasian looking babies that are 6-10 months old with photo IDs. Also seeking Caucasian looking toddlers who are around 2 years of age with photo IDs. Regularly check this calendar for the Central Casting Los Angeles office. For adults only, minors can register during Minors Registration on Tuesdays at 3pm. For adults only. SAG-AFTRA members will need to present their current SAG-AFTRA card every time they come to Re-Registration and Updates. Minors can re-register or update during Minors Registration and Updates on Tuesdays at 3pm. Your minor must still have the required documentation to be admitted. Reservations become available 72 hours in advance. Dates showing "unavailable" are either filled or not yet available to book. To afford all SAG-AFTRA members the opportunity to participate, attendance is limited to once every two months. Reservations open exactly 72 hours in advance. If the event shows "unavailable" it is either filled or not yet open to reservations. Reservations open 72 hours in advance. If the event shows "unavailable" it is either filled or not yet open to reservations. Central Casting University "The Professional Background Actor"
Guest Speaker: Michele Azenzer Bear, DGA. Reservations open 3 days in advance. If the event shows "unavailable" it is either filled or not yet open to reservations. If the event shows "unavailable" it is either filled or not yet open to reservations. Reservations are required.Click here to make a reservation. Central Casting cares about your minor’s success. Our Background Actors have the opportunity to interact with Casting Directors, meet other Background Actors, and learn from industry professionals. Check the Calendar for our latest community events. At our visiting sessions, a different panel of Casting Directors will answer your questions and give you valuable insight into the casting process and tips to be successful on set. Central Casting Los Angeles offers two classes, The Professional Background Actor and The Stand-In, for Background Actors who are active and eligible to submit for work. You will have the opportunity to hear from and participate in a Q&A with an industry professional guest speaker. Whether you’re seasoned or a first-timer, attend this class to polish your skills and learn from the industry’s leading experts in directing Background Actors. This class provides an overview of Stand-In work, including valuable information about the technical part of the job. An industry expert will answer your questions and help you prepare for your next Stand-In role. Do I need a reservation to come to Central Casting University or Visiting? Yes, you must have a reservation to attend Visiting or a Central Casting University class. You can make a reservation by selecting the event you wish to attend in the calendar and clicking the reservation link. Should I bring my minor’s headshot and resume? Can I give it to the speaker or Casting Directors? Do not attempt to give headshots or resumes to the guest speaker or Casting Directors. University classes and Visiting are for informational and enrichment purposes only. Do the classes cost money? The classes are free for Background Actors who are registered with Central Casting, are active, and eligible to submit for work. Will these classes help my minor get jobs? Central Casting University classes are for educational purposes and are designed to help you be successful on set. Attending a University class has no impact on the hiring process. Can my minor and I stay after to talk to the guest speaker? Some guest speakers offer to stay after the class has ended to answer questions. It is up to them whether to stay and for how long. Can my minor and I take care of other Central Casting business while we are there? No, Central Casting University sessions are reserved for classes only. You can make changes to your minor’s file during update sessions on Tuesdays at 3pm. Once you receive your minor’s work details, they’re officially booked. It’s important to write down your minor’s work information so you’re prepared when you head to set. What do I do if my minor is going to be late or needs to cancel? If your minor is working on a non-union voucher call 818.562.2799. If your minor is working on a SAG-AFTRA voucher call 818.562.2700. If you cancel, we ask that you give us enough notice to replace your minor. PLEASE NOTE: You may not cancel via text message. You must call our office. No, there is no guarantee of work because the needs of productions change every day. Due to the nature of background work, Central Casting can never offer full-time employment to any of the talent (i.e., your minor) it employs. This means casting is prepping a scene for a future date and is checking your minor’s availability. If you do confirm availability, please mark your calendar to limit conflicts. Your minor becomes “first avail” (first available) for that show. 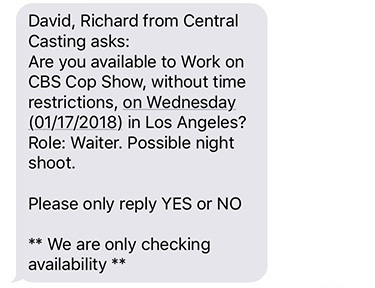 Typically in these situations, casting will not be able to hire your minor until the show looks at their picture submission and approves the look. After that, they will usually not release any booking until late afternoon the day before the shoot. If your minor is offered another booking on the same day, we ask for you to give us the courtesy of the “first right of refusal.” Just let us know so we can inform our show. They may option to offer to hire your minor first. Your minor is still able to be hired elsewhere if we are unable to confirm a booking for them. How do I get my minor’s details? You will receive a show name and 4-digit passcode from a Casting Director to access your minor’s Details Blog via our Details page. If you receive details via a SMS text message you must reply YES to the booking text message. The details blog will include a Call Time Change Box number for you to call to for minor’s call time changes and booking updates. Please review all provided information to ensure your minor is ready for work when you arrive to set. You can access the Call Time Change Box by calling 818.562.2966 and entering the 4-digit number given by the Casting Director. When can I call in for work? Our work lines are available 24/7. Check the lines often, as the Casting Directors update them throughout the day. Always check your voicemail. Do not call back until you have checked your voicemail to ensure the Casting Director did not leave specific instructions. If no message was left, wait and see if you receive a call back. If you do not receive a call back, assume your minor is no longer needed. All messages from Central Casting will be personalized with your minor’s name (as it appears in our system), reference the project name, and all replies will appear in the same thread. Yes, you are responsible for finding work and letting Central Casting know when your minor is available to work. Casting Directors work independently to meet the needs of their productions, so once your minor is booked, you are also responsible for them not becoming double booked. Yes, please respond to each request you receive. If a Casting Director books your minor for a specific role, it is your responsibility to decline any other offers to ensure they’re not double booked for the same day. Role details may or may not be communicated via SMS text message depending on the production. If your minor is booked, you will be notified where you should go to learn your full booking, wardrobe, and location instructions. These instructions might include a Details Blog and Call Time Change Box number. Do I still have to call the Call Time Change Box? Yes. Though your minor’s details may be provided to you as a details blog via SMS text message, you will still need to call the Call Time Change Box at 818.562.2966 and enter the 4-digit number given by the Casting Director for call time changes and booking updates. Please review all materials to ensure that you understand what will be expected when you arrive to set. If I receive a text message, does that mean my minor is booked? Your minor is not booked unless you accept an offer for work and receive details. Casting Directors may provide booking details through a Details Blog. Please review any materials provided to ensure that you will be ready for work. Once your minor has booked a job, they are ready to get on set! A guardian must always accompany a minor on set. It’s important to show up on time and camera ready. When you and your minor arrive, check in with your contact and get your minor’s voucher. Your time on set will vary, but a typical day lasts up to 12 hours. Your minor is an important part of the production, please ensure they are professional and have a good attitude on set. Be sure to read our article What to Do When Your Minor Books a Job for everything you need to know about being on set. What if I forget or lose my minor’s work information? It is critical that you write down all work information. If you lose your information or if you have any questions regarding work information call 818.562.2700. What do I need to bring for school on set? Have your minor’s work permit and school work ready to show the teacher. Bringing homework is required, even if the minor is home schooled. Where will I be when my minor is filming? You will be on set with them, behind the scenes. Please stay within your designated area and do not interfere with production. Be prepared to accompany your minor when they go to wardrobe, set, and to school. What if a parent cannot accompany the minor to set? Another guardian (21+) must accompany the minor. What happens if I get booked on the same show as my minor? Another guardian (21+) who is not working on the show must accompany the minor. Can I bring other children or guests to set? Do not bring anyone to set who is not working, including other children. How will I know if my minor’s call time changes? Call the Call Time Change Box at 818.562.2966 and enter the 4-digit number given to you by the Casting Director. It is your responsibility to get call time changes for each booking. Who will my minor and I report to on set? Roles change from set to set, but often Background Actor’s main contact is the 2nd Assistant Director (2nd AD) and Production Assistants (PAs). What happens when my minor is not filming? When your minor is not required on set, you both will be taken to a holding area or to the school area. You can bring items to the holding area to keep busy while your minor is not working. Where can we eat on set? During designated meal breaks, craft services will provide food. Please eat breakfast before you arrive. Guardians, please allow all minors to get their meals before you get yours. Do not ask craft services for food outside of your designated meal times. If your child has special dietary needs, please bring food to set with you. It is not production’s responsibilty to supply specialty food. You are allowed to bring snacks to eat throughout the day. What happens if my minor gets hurt on set? Central Casting handles both casting and payroll services. When your minor registers with Central Casting, we become their employer and, in most cases, are responsible for paying them. How soon after my minor works can I expect their paycheck? Checks are due to be mailed on the Thursday after the week your minor worked. They may be mailed out earlier depending on when the production company turns in the complete and accurate vouchers. Can I pick up my minor’s paycheck? How long does it take for me to receive a check after it’s mailed? Why do I sometimes receive paychecks out of work date order? Do I need to write my minor’s Social Security number on their voucher every time they work? Yes, there are many people we payroll with the same or similar names. You will need to put your minor’s Social Security number on each voucher so we can correctly identify who we should pay. Your minor’s voucher will either be delayed or not processed if we are unable to identify who worked. For payroll inquiries, please call 800.562.2718. Representatives are available Monday-Friday, 8am-5pm. How do I change my minor’s address with payroll? You may change it on your minor’s voucher when they work or you can fill out our address change form. You must update your minor’s address with both payroll and casting, as we store information separately. You can either fax or mail us your stop payment request. You will need to specify in writing that you are requesting a stop payment and include your minor’s name, Social Security number, address and signature, along with the work date and show name for the check you are missing. If the net of the check is over $150, you will need to sign a bank form supplied by our department and have your signature notarized before we can place a stop payment. For your convenience, we have a notary available free of charge by reservation only. You can set up a reservation by calling 800.562.2718 between 8am-5pm. Call 818.955.6313 or send your request in writing to our payroll department either by fax or through the mail. Be sure to include your minor’s name, Social Security number, address, and the year(s) they worked. You will also need to state whether the request is for your own personal records or to enable your minor to join SAG-AFTRA. SAG-AFTRA will only accept faxes sent directly from our payroll department certified by our manager. How do I get my minor’s W-2? To access your minor’s W-2, visit EP’s W-2 page. How can I submit an inquiry or correction to my minor’s tax form? To submit an inquiry or correction to your minor’s tax form, please fill out and sign our inquires and corrections form. How can I verify my minor’s employment with Central Casting? You can come in anytime during minors registration to re-register, add photos, and make profile updates. It’s important to keep your minor’s file current so Casting Directors know their look and details. Here’s what you need to know about Re-Registration and Updates. Your minor and the required documentation to accompany the I-9 form. Can my minor take a new photo? A digital photo of your minor can be taken in our office when you come to update their profile. If you would like additional photos added to your profile, bring the photos to an update session. Only hard copies of photos will be accepted. We cannot accept discs, CDs, or memory sticks. Photos submitted will not be returned. How do I change my minor’s status from Non-Union to SAG-AFTRA? You can change their status during update times. You must present your minor’s identification along with their current SAG-AFTRA card and fill out a data change form. How do I change my minor’s file information? If you would like to update or change any information you can do so during the update times. Forms for informational purposes only. DO NOT print to bring to registration.